In my opinion, clarity, amplitude and interactivity are clearly needed in the conversation surrounding the wide-ranging topic of climate change, lest it resembled the dialog of the hard of hearing! Said differently, we need a true dialog on all aspects of climate change in order to focus on solutions. Clarity is needed in terms of being clear about what the topic of discussion really means, and about the context surrounding each topic. For example members of the scientific research community, including many who have contributed to the climate assessment efforts, are of the opinion that the more we do in terms of mitigation, meaning reducing our impact on the climate mainly by reducing GHG emissions, the less we will need to do in terms of adaptation. In fact these opinions are reflected in the narrative of the USA National Climate Assessment, despite comments submitted by many (including me) warning that such a statement showed a lack of understanding about the widely different timelines applicable to adaptation measures and to mitigation measures. To clarify: it is a widely accepted scientific fact that any effective reduction in GHG emissions may only show effective results over the long term, meaning in hundreds and even thousands of years. On the other hand a properly designed adaptation measure that is implemented today, say for example in the construction of a building or protective works, becomes effective upon completion today in terms of reducing the potential for damage from current and future impacts. Along the same lines when the topic of discussion is adaptation there are individuals who bring-up green-building design as a model for reducing GHG emissions, reducing the carbon footprint of a building, and energy efficiency, which are all good examples of mitigation NOT adaptation. Green-building design does offer some adaptation benefits, i.e. : (a) Improved interior performance under rising temperatures; (b) More efficient usage of diminishing water resources, or (c) Enhanced energy efficiency and lower operating costs. However, the fact that these adaptation benefits are overlooked in favor of emphasizing the contribution green-building design makes to mitigating human impact on climate, while discussing adaptation, shows lack of clarity regarding what constitutes adaptation. Amplitude is essential in this conversation, in three senses: (a) In terms of the extent of disciplines and representative opinions that are needed, which we must engage, to rigorously and effectively examine possible or proposed adaptation solutions, (b) In terms of the breadth of open-mindedness that we all must express as participants in the conversation, which from my perspective goes to our ability to listen to what others are saying, and our commitment to judging what others are saying or proposing with scientific objectivity, strictly on their merits, and (c) In terms of our ability to see the big picture rather than just focusing on the minutiae of details that may prevent some of us from understanding the true context in which the conversation is taking place. Interactivity is an essential ingredient on all conversations, but is also one that is in some cases lacking when it comes to discussing global climate change or some specific aspect of it. This lack of interactivity is clearly evident when politics or ideology interferes with open-minded clear communications between people. What is especially problematic in this regard is when scientists who are on the same side of the climate discussion allow discipline-based differences to interfere with the two-way flow of information or the objective flow of views and ideas between people. Interactivity in the context of conversation on climate is, in my view, as much about our individual ability to convey and explain complex scientific or engineering concepts to a wide range of audiences, as it is about our ability to listen to what others say and the context in which it is said, for this is without doubt an essential ingredient in our understanding of how science and engineering can help us arrive at solutions to pressing problems. With a commitment to this need for clarity, amplitude and interactivity, I participated as a speaker in a working meeting convened by Dr. Leonard Berry, Ph.D., Director of the Florida Center for Environmental Studies (CES), on 12 March 2014 at the main campus of Florida Atlantic University (FAU) in Boca Raton, Florida, to start a conversation about adaptation alternatives that may be available to Southeast Florida, and to other equally vulnerable communities or regions in Florida, the USA or elsewhere, to protect from adverse consequences of the most-damaging combination of sea level rise and storm surge. I focused my brief remarks (A STRATEGY FOR REGIONAL PROTECTION ), to the small and multidisciplinary group invited to participate in the meeting, on the following views: (a) Storm surge exacerbated by SLR must be viewed as a natural hazard or, said differently, as a source of potential damage to our vulnerable region, (b) We can reduce the potential for damage from the impact of SLR/Storm surge by implementing effective hazard mitigation measures, (c) There are three classes of alternatives for these hazard mitigation measures, they are: (1) Keep hazard away, (2) Interact with hazard, and (3) Get away from hazard. These remarks set the context for the second phase of my presentation, an invitation for participants to think about the class of hazard mitigation measures designed to keep the hazard away and consider the feasibility of designing, buildings, and deploying a combination of measures that could provide regional protection to Southeast Florida, defined as the region comprising three of the four counties signatories of the Four County CC Compact (http://southeastfloridaclimatecompact.org/), namely: Palm Beach, Broward, and Miami-Dade. I also invited participants to challenge the stereotype that no major protective works, such as those deployed in the Netherlands, or Venice, or in the UK, are possible in this region because of the porous limestone substrate of the ocean floor. In support of this I argued that: (a) We can’t say ‘it is not possible‘ until we shall have exhausted all lines of inquiry including applied research into the possibility of counteracting or neutralizing the porosity of limestone by a combination of chemical,mechanical and engineering methods; (b) We have numerous examples in this region of using this approach to do exactly that, manage the porosity of limestone, these examples include: (i) The construction of two tunnels connecting the Port of Miami (Dodge Island) with Watson Island, which went right through limestone and reached 140 ft below the ocean floor; (ii)The construction of slurry walls, right through limestone, to protect the Everglades from stone-mining activities in the western fringes of Miami-Dade County; (iii) The numerous high-rise buildings built on the coastal region where the construction of foundations has required successfully managing the issue of limestone and water penetration at the job site; (iv) Major engineering works to reinforce the Hoover dike around Lake Okkeechobbee, or to upgrade major berms and other structures that are part of the SFWMD network, all of which have had to deal with the limestone issue. (a) Can we extrapolate what we have learned from these successful smaller-scale examples of managing the porosity of limestone, to the much larger scope required for regional protection projects? (b) What kinds of applied research and testing do we need to conduct to determine if it is possible or not to effectively and permanently counteract the porosity of limestone at the much larger scale that would be required for regional protection measures? (c) Can we deploy regional protection works and also maintain navigational access for commerce and for pleasure, preserve sand-transport for our beaches, protect marine flora and fauna and the health of coral reefs, while also preserving the region’s way of life, standard of living, and critical economic drivers? (d) How much will it cost to design and build the type of regional protective works that would be required for the region? (e) What environmental – ecological issues would need to be resolved in order to deploy this kind of regional protection? (f) How do we measure the cost-effectiveness of such regional protection? (g) How much time will we buy by building such regional protection works? (h) What alternatives does the region have in the event that as a result of our collective peer-review and results of research and extensive studies, we find that it is not feasible to build regional protection measures to defend against the combined and progressively more damaging expected impacts of SLR/Storm surge? THE TOWN OF SURFSIDE, FLORIDA DOES THE RIGHT THING! 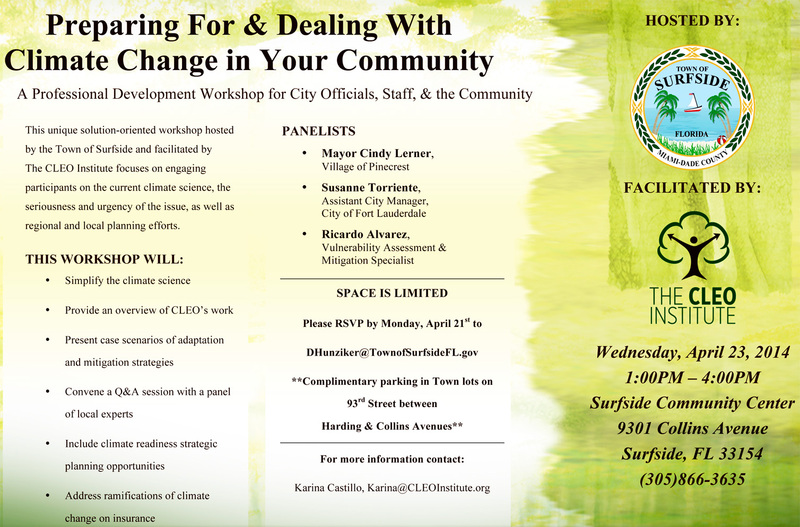 This past Wednesday, 23 April 2014 the Town of Surfside in Miami-Dade County, Florida hosted a most interesting event facilitated by The CLEO Institute, a local non-profit, to engage their own City officials and staff, and residents of the community in an effort to take a long and careful look at what global climate change means in terms of potential consequences for the town, and what is it that Surfside as a community and each one of us those who reside there as individuals can really do. Preparing for and dealing with climate change in your community as the event was designated, was offered as a Professional Development Workshop for City Officials, Staff and the Community. 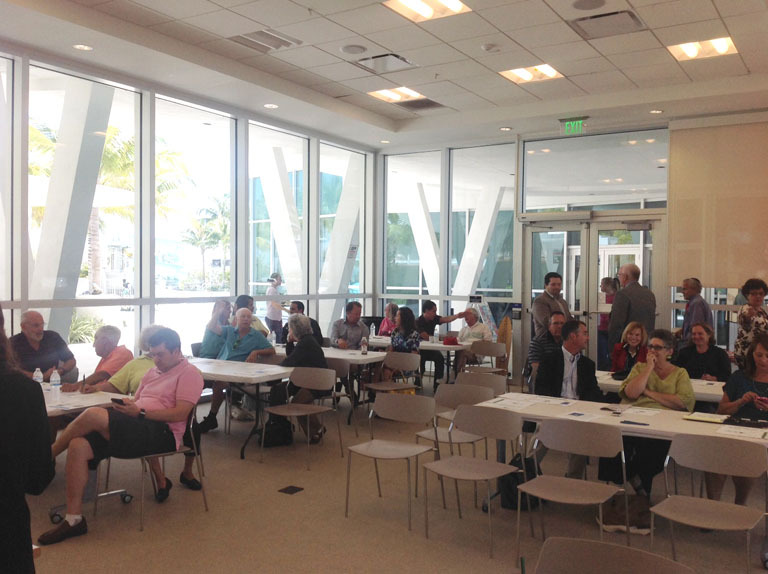 The workshop took place on Wednesday 23 April 2014 from 1:00 to 4:00 p.m. at the new and beautiful facility that is the Surfside Community Center, 9301 Collins Avenue, Surfside, FL 33154. With Town of Surfside Mayor Daniel Dietch, other town officials and staff members, including the director of public works, and 40+ residents in attendance, against the beautiful backdrop on sea grapes, the dune, the beach and the waters of the Atlantic ocean visible through the windows of the facility, and the traffic on Collins Avenue and buildings of this one-square-mile town on the other side, workshop moderator CLEO Institute’s Director Caroline Lewis summarized what science tells us about climate change, global warming, sea level rise and their expected consequences at the regional and local levels. The workshop featured a panel of local experts/leaders who presented their views and facts on a wide and challenging array of relevant topics, capturing the audience’s attention, questions and commentary. The panel included: Mayor Cindy Lerner, Village of Pinecrest, Susanne Torriente, Assistant City Manager, City of Fort Lauderdale, and Vulnerability assessment and Mitigation expert and consultant Ricardo A. Alvarez (A STRATEGY FOR REGIONAL PROTECTION) a research affiliate at the Florida Center for Environmental Studies, Florida Atlantic University. Congratulations to the Town of Surfside, its Mayor, elected officials and staff, must be congratulated for taking the initiative in engaging residents of its beautiful seaside community in Miami-Dade County in a critically needed and current dialogue about what is and will continue to be the most relevant issue confronting humankind. Let us trust that the example set by the Town of Surfside will soon be emulated by other proactive communities across Florida and the USA. Kudos also to the CLEO Institute, its Director Caroline Lewis and Program Manager Karina Castillo, for helping facilitate this particular event and for being a leader in these efforts for the benefit of our vulnerable communities.